Watch the trailer and buy THE END OF MEAT here. Author and director, Marc Pierschel, has focused intensively on the relationship between humans and animals – as shown by his documentaries "Live and Let Live" and "184" or his bestselling books on vegan nutrition. 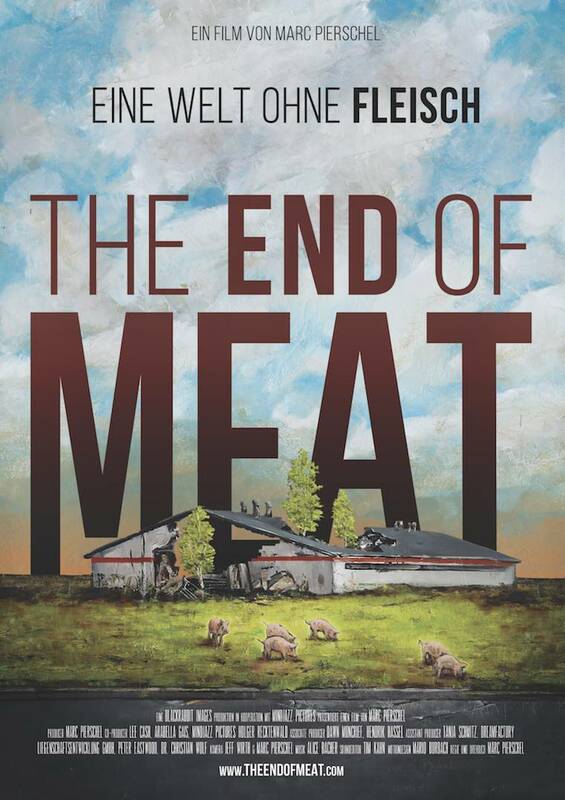 In his latest film, "The End of Meat", he pursues the idea of a utopian world that doesn’t use livestock and talks to people about living without meat, the consequences of industrial meat production and scientific progress on lab-grown AKA cultured meat. There’s a sentence in your film that addresses the core question of whether making a genuinely fresh start is realistic: "It would take a disaster to force us to think differently." Is that really the only way? I obviously hope not. Although you could argue that it’s already happening. But just not right in front of our noses yet, which would really prompt us to take action and change things. In other countries, environmental damage is more advanced. But we’re seeing warning signs in Germany, too – or example in the increasing nitrate levels in groundwater caused by agricultural slurry spreading or in the deaths of insects linked to pesticides used in producing animal feed. These are all little signs of impending disaster unless we change our consumption – our consumption of animals. The link between livestock and the Earth’s ecological decline is increasingly becoming the core issue in this debate – which elevates the matter far above mere ethics. Is the problem growing faster than we are able to solve the individual causes? The problem is partly to do with not being able to link the two directly. Climate change is obviously not as simple as meat consumption. But meat consumption is nevertheless a big part of it and perhaps the part that consumers can influence the most. I fear that politics is also part of the problem, because there are no initiatives or incentives to change anything. There is also a powerful lobby - not just in Germany, but in other countries, too –that obviously has an interest in keeping consumption going. And if there’s no political engagement, no (for example) climate tax on meat and other environmentally-harmful products, then I’m not sure it’ll be enough just to have a more plentiful supply of meat alternatives. The power seems very unevenly divided between the interests of the food industry and consumers and consumer groups. How important are the close ties between politics and industry? On the one hand, the industry has obviously noticed that demand is growing for alternatives to meat. One clear sign of this is that meat companies in Germany are now also producing and selling vegetarian and vegan products. Another is companies like the PHW Group and its Wiesenhof subsidiary, which are now investing in cultured meat, i.e. laboratory-produced alternatives. So it’s clear that this is more than just a trend and firms don’t want to miss out on it. Sooner or later, I expect this to be reflected in politics, too. But it needs to reach a tipping point among the wider public first. If the political parties notice a big interest in it, then there will be initiatives to promote it. There are already some small, initial steps, such as standardizing vegan and vegetarian labelling, including at the EU level. But if consumption is to be genuinely promoted, then political parties need to get involved more decisively. In "The End of Meat" you use the phrase: "The social justice movement of our times". Steven Wise, whom you talk to in the film, is another one taking a revolutionary approach, with his animal rights lawsuits in the USA. He admitted, he was only making a start on a process that he believes will take several generations. But at all of these different levels, the core issue is always the need for a change of attitude. Is it possible to reach enough people? Looked at altogether, this is a very complex subject on many levels. Steven Wise is campaigning purely in the legal arena and obviously faces completely different opponents. Of course, he’s pursuing a completely different type of change that will have to take place on a much broader basis to gain a foothold in the future. There are a range of different approaches coming together, but it is only when these initiatives reach a critical mass together that they will make a difference. Going it alone won’t work. Besides this, we’re already seeing that millennials have a completely different attitude. They didn’t grow up completely in a world of meat and meat-based meals. On social media, images of factory farming or animal exploitation travels fast: They are far more aware. We are seeing that classical meat consumption is starting to become a bit unfashionable. These young people are more adventurous, and have not necessarily just followed the established way of doing things, the way their parents did. This new awareness is one of the key factors that will, in future, bring this issue into the public eye and help society to recognise the need for change. And of course, you also have the other aspects coming into play too, such as health and environmental concerns, which help to advance the issue faster than ethical arguments alone. How helpful is it to display these pictures up close? Do they not, in some circumstances, just turn people away? In "The End of Meat", I have deliberately avoided using those types of images, precisely because I have learned that people simply won’t watch the movie otherwise. Instead, I've tried to focus on the stories - stories of activists who have seen the images, who know what's going on, but who can communicate it better on an emotional level to people who prefer not to see it themselves. Is society still open to visionary movements, in this era of “alternative facts”? Or are we already polarised into opposing extremes? My aim with this film is to present just such a vision and ask “What if?” But even when I started making the film, I found it extremely difficult to imagine living with animals differently, because we’ve been born into this attitude that a certain group of farm animals exists to be turned into food. The problem is also that many of these animals are simply hidden from view. Pigs are the commonest type of livestock in Germany, but few of us ever see them – unless it’s on a dinner plate or in the supermarket or maybe in a truck on the motorway. It is simply vital that we bring these animals into the public consciousness, to make them visible to people and to show that these individuals are not really all that different from pets - that is key.